Fries and a frikandel from a frituur. The sauces on the fries are mayonnaise (white, foreground) and curry ketchup (red-orange, behind). Curry ketchup, also called Currygewürzketchup (curry spice ketchup) in Germany, is a spiced variant on ketchup and a common sauce in Belgium, Germany, Denmark and the Netherlands. It is typically served on prepared meats such as frikandel, or on French fries. 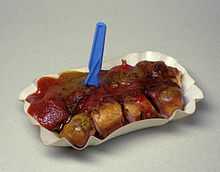 In Germany, it is the basis of the dish currywurst, one of the most popular in the country. Typically with currywurst, additional curry powder is sprinkled on top of the curry ketchup. Major brands producing curry ketchup include Zeisner, Heinz, Hela, and Knorr. Currywurst, Berliner style. The red sauce is curry ketchup with additional curry powder sprinkled on top. ^ a b Emily Ho (June 17, 2009). "Ketchup With a Kick: Add Curry Powder!". Retrieved April 20, 2011. ^ "Curry Ketchup | Zeisner" (in Dutch). Zeisner.be. Retrieved 2012-11-20. This condiment-related article is a stub. You can help Wikipedia by expanding it. This page was last edited on 10 July 2018, at 15:57 (UTC).